Amtrak provides intercity passenger rail services to more than 500 destinations in 46 states on a 22,000-mile route system. Amtrak recognizes that greenhouse gas reduction is a multi-dimensional concern, and encourages passengers to take practical steps to reduce carbon emissions where possible. For schedules, fares and information, passengers may call 800-USA-RAIL or visit www.amtrak.com. 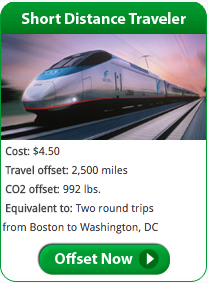 Amtrak has partnered with Carbonfund.org, allowing passengers to offset the carbon emissions footprint generated by their individual rail travel by making a contribution to Carbonfund.org. 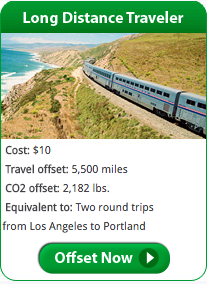 To offset rail travel, passengers can calculate their carbon footprint using the Rail Calculator or simply choose from one of three affordable preset options. 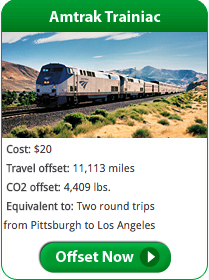 For custom rail travel emissions calculations, enter your departure and destination cities below. For multi-leg or long-distance rail travel, please enter and calculate each travel leg separately.